Welcome to the third edition of the SPIRAL newsletter. This is an exciting time for science-policy interfaces for biodiversity. Most notably IPBES, the Intergovernmental Science-Policy Platform for Biodiversity and Ecosystem Services, was established officially in Panama in April. At the European level there is progress on a European mechanism to support IPBES in Europe, and in Africa, AfriBes is building a network for scientific and technical information on biodiversity and ecosystem services. There has also been progress on many national and sub-national science-policy initiatives on biodiversity. SPIRAL team members are actively contributing to these debates on science-policy interfaces, not only for biodiversity but also for environmental policies more broadly. This happens through our involvements with test cases, including IPBES and AfriBes, and also through our networks in the worlds of science and of environmental policy and through our participation to workshops and conferences around these issues. In this issue of the newsletter you will find information on current SPIRAL activities - and how you can get involved! We also include news on forthcoming and recent SPIRAL workshops and as well as some first results on Science-Policy Interfaces (SPIs) – what works and what doesn’t, and how we can better understand them. And as usual, we invite you to meet some members of the team: the University of Helsinki and the Helmholtz-Zentrum für Umweltforschung GmbH -UFZ. Do not hesitate to browse our website for more information, or to get in touch should you have any question or wish to contribute. If you’re interested in the interface between science and policy, why not join our Dynamic Network of Advisers? Just get in touch with us at info@spiral-project.eu as we’ll take it from there. Following seven years of discussions, over 90 countries finally adopted a resolution to establish an Intergovernmental Science-Policy Platform on Biodiversity and Ecosystem Services (IPBES), a key achievement reached at the last minute after a long and somewhat tedious negotiation process. Another highlight was the selection of Bonn, Germany as the physical location of the secretariat after a very close vote on Thursday evening. After the first session held in Nairobi in October 2011 and the intensive intersession work, much was expected from this second session of the plenary meeting on IPBES that took place on 16-21 April 2012 in Panama City, Panama. Over the course of the week, discussions addressed functions and structures of bodies that might be established under the platform, rules of procedure, location of the secretariat, and touched upon some aspects of the work programme of the platform. As negotiations went on, key aspects raised major concerns and questions, from very general ones such as “How will IPBES find its niche in an already complex and crowed landscape?” to more specific ones such as the credibility of IPBES, emphasized by numerous governments as the criterion for the platform based on an objective, independent and inclusive mechanism. In this context, discussions addressed possible links of the IPBES with the UN system, voting procedure, status of observers or credentials of members. Regarding the work programme, several interventions called for a “bottom-up approach” strengthening national capacity, including all stakeholders (e.g. traditional knowledge holders, civil society…), and aiming to ensure that local knowledge inform appropriately a centralized global body. The agreement reached during the session was described as the “bare minimum” to operationalize IPBES by the IISD reporting: two subsidiary bodies were created, a Bureau and a Multidisciplinary Expert Panel (MEP), but governments could not agree on their definite composition as delegates had divergent opinions on what regions should be used to determine representatives: UN regions, CITES regions, other biogeographical regions... Thus, an “interim” bureau maintaining the current officers and an “interim” MEP composed of representatives of the UN regions will lead the inter-sessional work and will be in charge of delivering a catalogue of assessments, a conceptual framework for assessments and a review of existing capacity building activities and scope, with the support of the “interim” secretariat, UNEP. Significant outstanding issues remain including decision making procedure based or not on consensus, the possibility of IPBES becoming a UN body, the host institution, and the question of membership of regional economic integration organizations (REIOs) . In addition, IPBES will have to address issues related to how the work programme will be defined and operationalized. 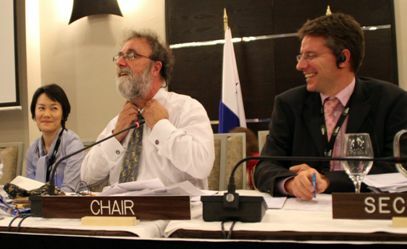 The establishment of IPBES was met with a standing ovation on the evening of Saturday April 21st as Chair Robert Watson put back his happy dragon tie and stated “Biodiversity won today” (see photograph above). Let’s hope political agendas and struggles do not delay the start of the platform too much so the real work can start and indeed make a difference for biodiversity. For more information, please consult the official IPBES website or the IISD reporting services. 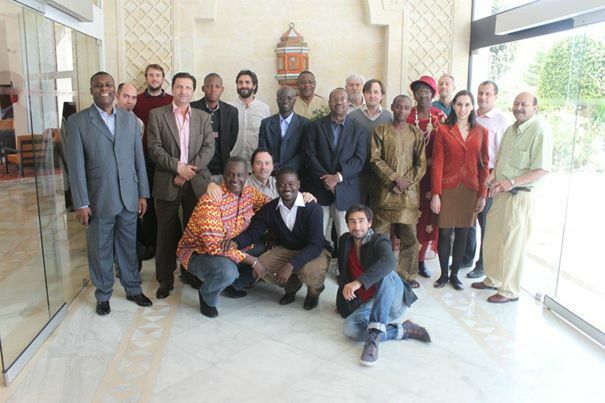 On April 23 & 24 the first workshop of the AfriBes network was held in Tunis. This workshop gathered around 25 participants from Algeria, Burkina Faso, Cameroon, Canada, France, Ghana, Morocco, Niger, Senegal, South Africa, Spain and Tunisia. A broad range of biodiversity stakeholders were represented including NGOs, research institutes, IOGs, local authorities and the private sector. Linking with IPBES, as well as with other organisations, was also discussed - but needs to be further discussed. A working group will be set up on this topic. A complete report of the workshop will be soon available on the AfriBes website and on the SPIRAL website. SPIRAL WP2 will be hosting a workshop on June 8th, 2012, in Edinburgh, to present the results of work on factors constraining and facilitating communication on the role of biodiversity in underpinning livelihoods and ecosystem services. 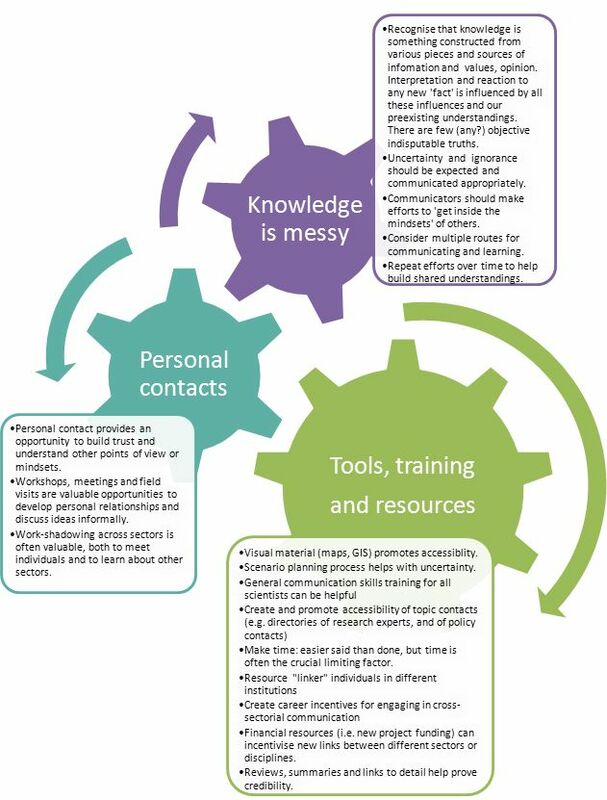 We have been analysing the results from three case studies over the last few months to extract initial insights on what works and what does not work in terms of communication on biodiversity (see below for a preview!). Participants representing a wide scope of expertise and perspectives will be invited during the workshop to discuss these results (the full set will be available on the SPIRAL website soon) and produce a set of recommendations to improve communication between science and policy for biodiversity. 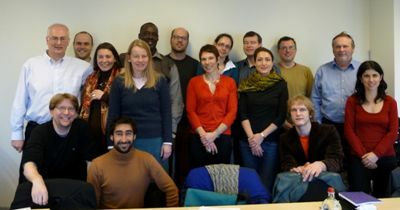 SPIRAL is planning a joint workshop with the European Environment Agency (EEA) in September 2012 that will explore ways to improve the science-policy interfaces of EU-funded biodiversity research projects. One of the specific focuses of the workshop will be on how to improve the input of research projects into the Biodiversity Information System for Europe (BISE) which is managed by the EEA. The potential of Eye on Earth as an SPI tool will also be explored. More information about the workshop will be uploaded soon on the SPIRAL website. The University of Helsinki is the biggest and most diverse university in Finland with almost 4,000 researchers and teachers on four campuses in Helsinki and at 17 other locations in Finland. The high-quality research carried out by the university creates new knowledge for educating diverse specialists in various fields, and for utilisation in social decision-making and the business sector. One of the strategic key areas of research is the environment. The Department collaborates closely with Helsinki University Environment Centre in research and teaching. The Department has strong international links and wide international collaboration both in research and teaching. The Helmholtz Centre for Environmental Research (UFZ) was established in 1991 and has about 1000 employees in Leipzig, Halle and Magdeburg. The UFZ is part of the Helmholtz Association which is Germany's largest scientific organization with an annual budget of approximately 3.4 billion euro. UFZ conducts environmental research in a broad range of disciplines. The research portfolio includes research on environmental biotechnology, groundwater remediation, biodiversity, environmental politics and ecological economics to name a few. UFZ assigns high priority to couple scientific excellence with the responsibility to deliver useful research as a basis for decision-making and technological application. This is mirrored by a range of projects which aim to improve the science-policy interface. Science-policy interfaces: how can we make them work better? Based on two workshops and eight interviews involving scientists and policy makers, SPIRAL WP3 partners have come up with a set of measures to support the design, development, assessment and evaluation of SPIs. These measures include aspects such as degree of independence, selection of participants, resources, vision, continuity, trust building, conflict management and many more. These measures need to be looked at on a SPI by SPI basis – there is no “one size fits all” when it comes to SPIs - but we believe these measures can provide people working in SPIs with a better idea of what their SPI needs to consider and how to manage SPIs better. We’re working on a report now, and will be publishing fact sheets to support SPIs. Keep an eye out for these on the SPIRAL website. How are our test cases doing? SPIRAL WP4 aims to contribute practically to the design, implementation and testing of science-policy interfaces for biodiversity through a number of test cases in which SPIRAL is involved in an ad hoc manner (e.g. IPBES, AfriBES - already covered in the earlier articles). Test cases we’re looking at and getting involved in include a future EU mechanism interfacing science and policy for biodiversity and ecosystem services, Phase 3 of The Economics of Ecosystems and Biodiversity, the European section of the Society for Conservation Biology, Science for EU Environment Policy Interface, and many more. Have a look at our website for more detail on what we’re doing in these interfaces. The next couple of months are going to be very busy in SPIRAL, mainly trying to package and disseminate the results we have come up with so far, and feed those results into the work we’re doing in the test cases. If you are interested in our results, or if you have ideas on how best to help disseminate our results, get in touch with us. The easiest is by email: info@spiral-project.eu. We’ll be updating you again via newsletter in September. In the meantime, please check the website or email us anytime. We’re also at lots of meetings and conferences if you prefer to talk!